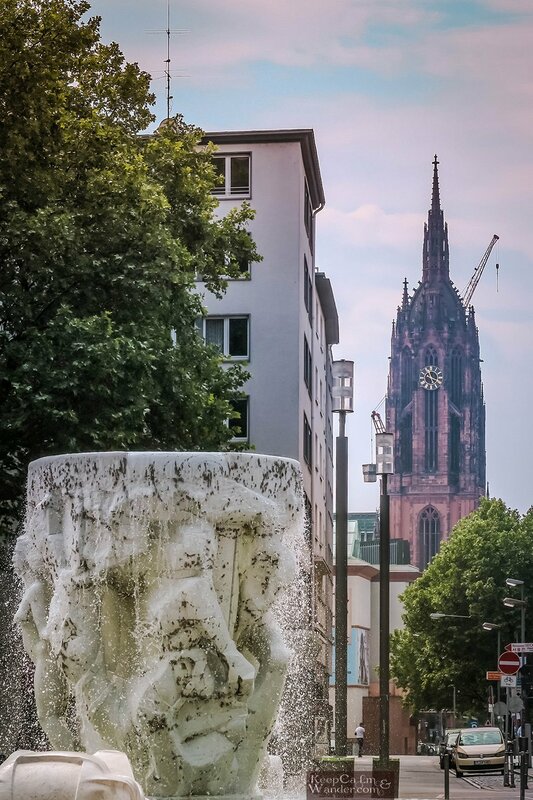 Let’s just say that you have a day in Frankfurt. Or at least 8-10 hours of connecting flight in the city. If you are boarding on a Lufthansa Airline flight, there is a huge chance you will be transferred at/from Frankfurt am Main Airport. 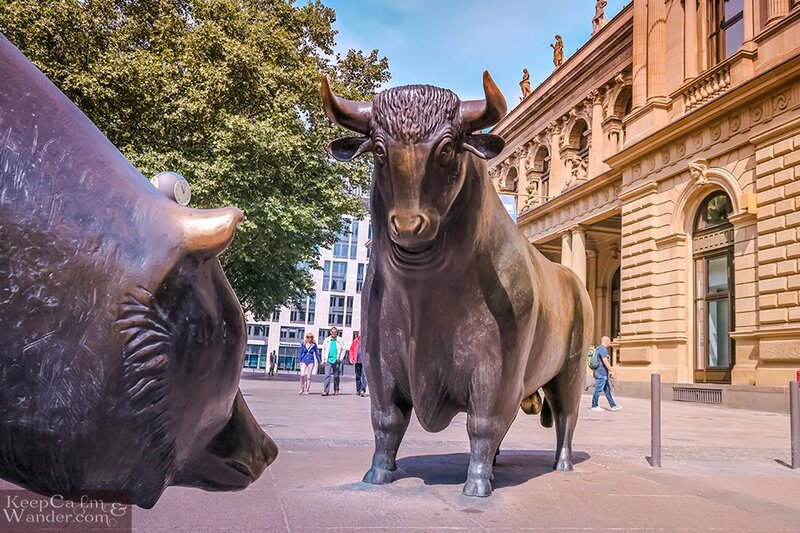 Don’t fret – the airport is well-connected with trains to downtown Frankfurt. 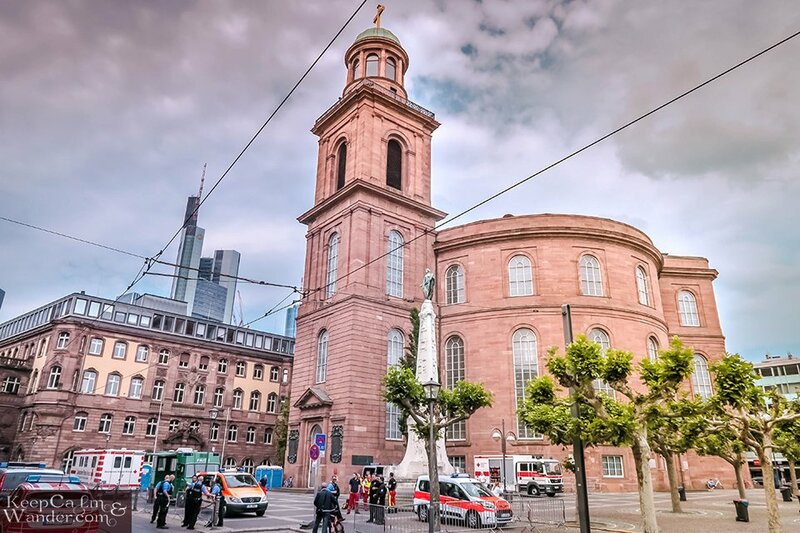 Travel Itinerary: A Day in Frankfurt (Germany). 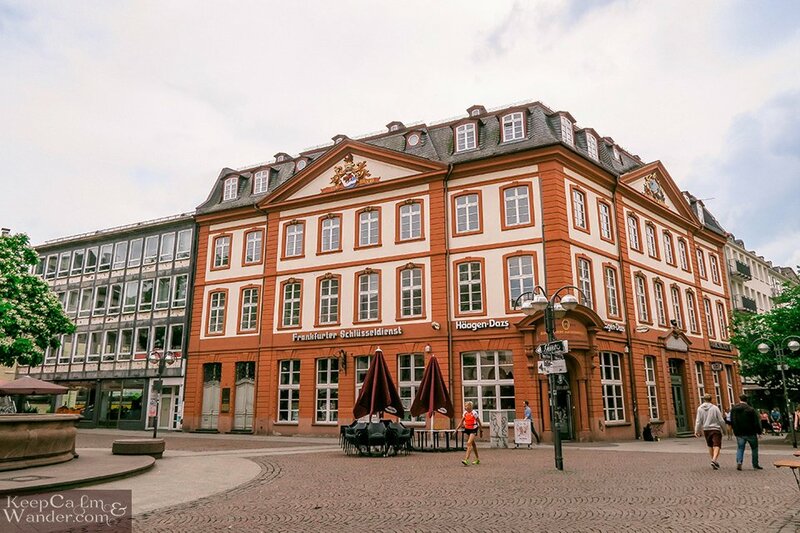 So, if you have a day in Frankfurt, here are my suggestions – starting from the main train station. 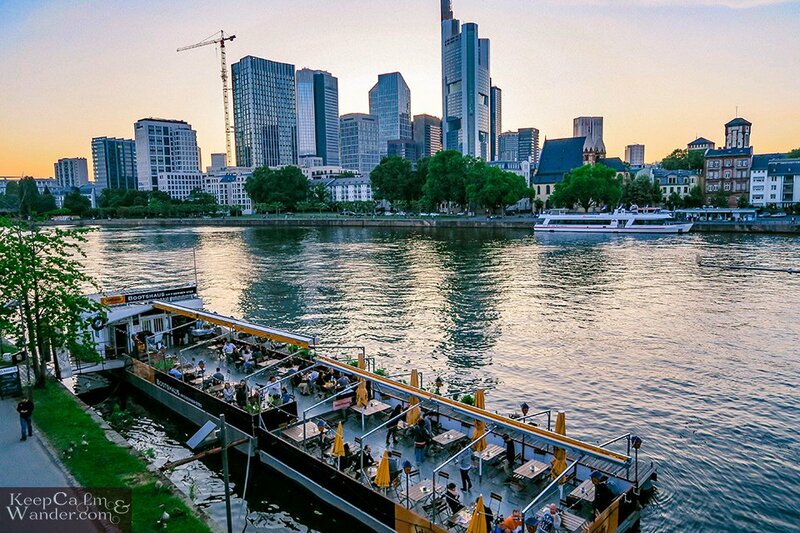 Take note that this travel itinerary of Frankfurt does not include recommendations for restaurants and bars because you can always go into one – anywhere in the city. Also, museums and galleries are not included here. 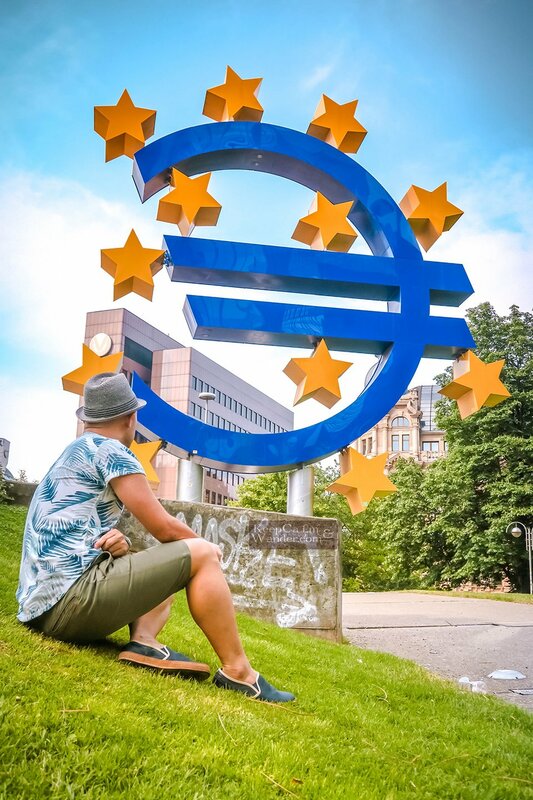 Well, you’re certainly in Frankfurt if you can find this giant sign of the euro. It’s just about 10 minutes walk from the main train station. 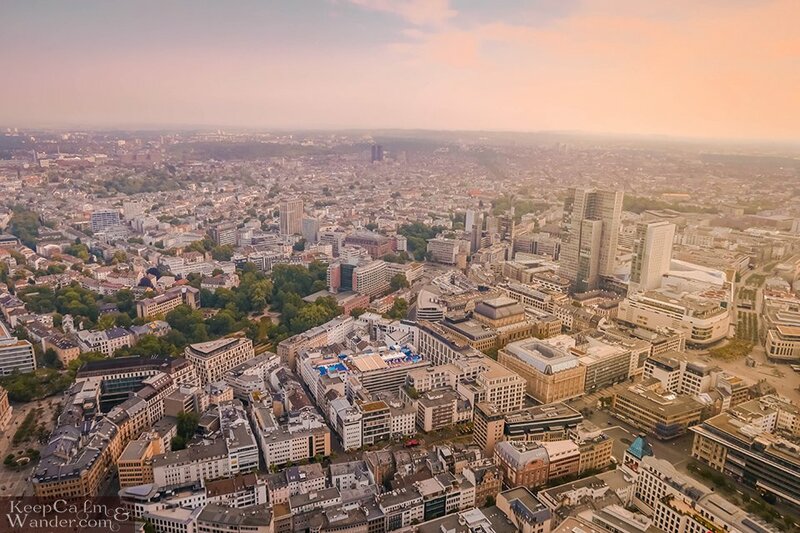 It’s a food start to get to know Frankfurt from the top of the Main Tower. Not far from the euro sign, you’ll find the Main Tower that stands at 200 meters. This is Frankfurt and Germany’s 4th tallest building with 56 floors. 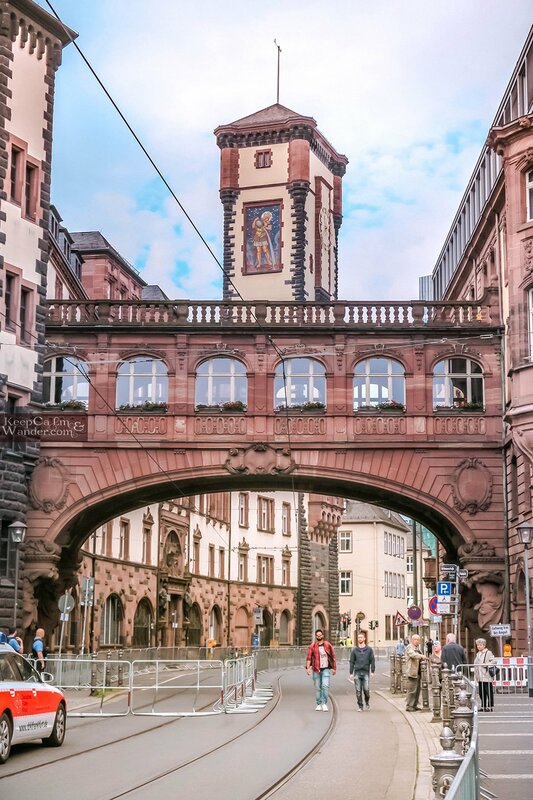 From the Main Tower / Travel Itinerary: A Day in Frankfurt (Germany). Alte Oper (Old Opera) is the first opera house in Frankfurt. It was opened in 1880 but knocked down by bombs during World War II (1944). Slowly, it was rebuilt in the 1970s and in 1981 it opened again. I didn’t have much time to go inside, so I just admired its amazing facade from the square in front of it. 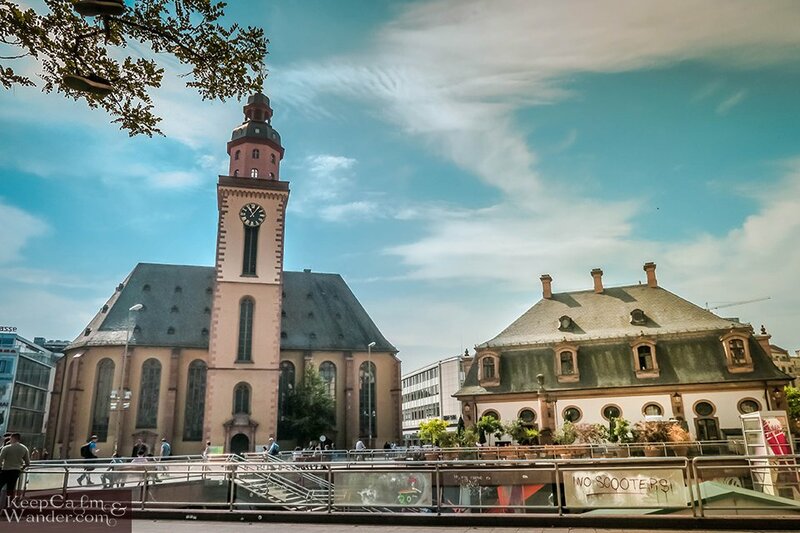 Alte Oper / Travel Itinerary: A Day in Frankfurt (Germany). 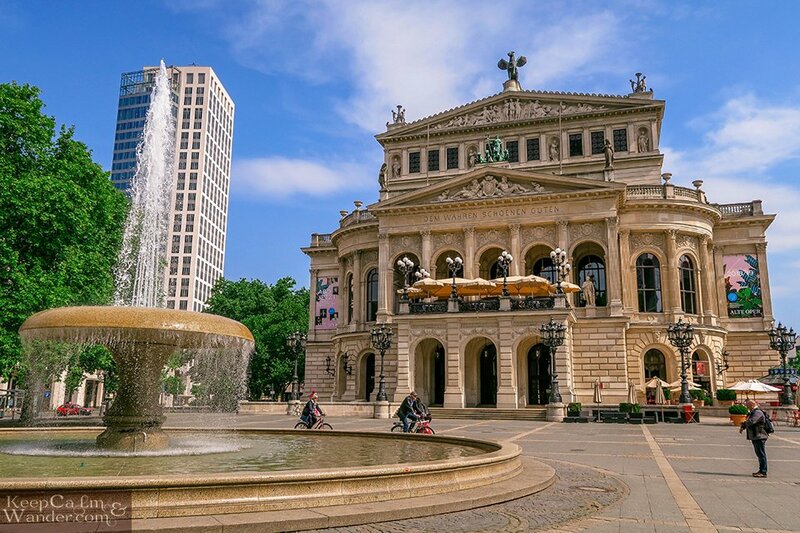 Across the Alte Oper is another magnificent building you can admire from the outside. You own walking tour would get more interesting if you are not focused on your destination. Take time to look around you and you’ll never get disappointed. 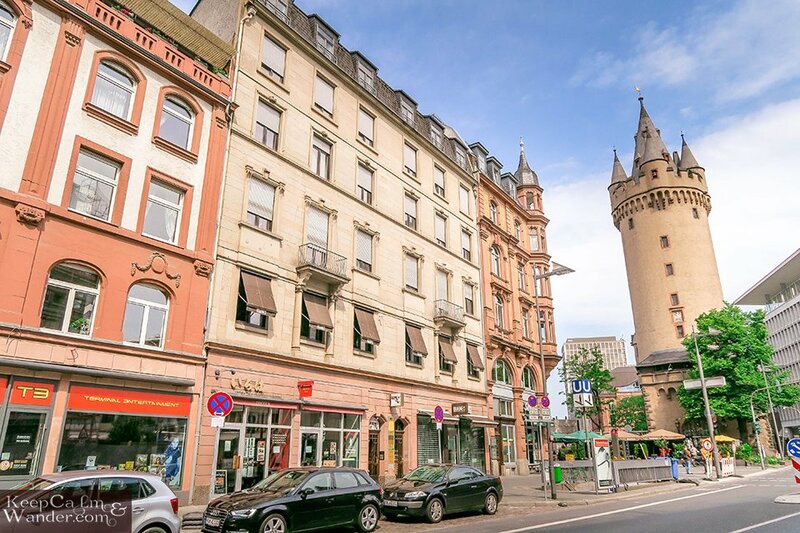 Frankfurt has unique, well-preserved buildings in all shapes and colors. Unique Architecture in Frankfurt, Germany. If it is closed, just admire its pink-washed facade. 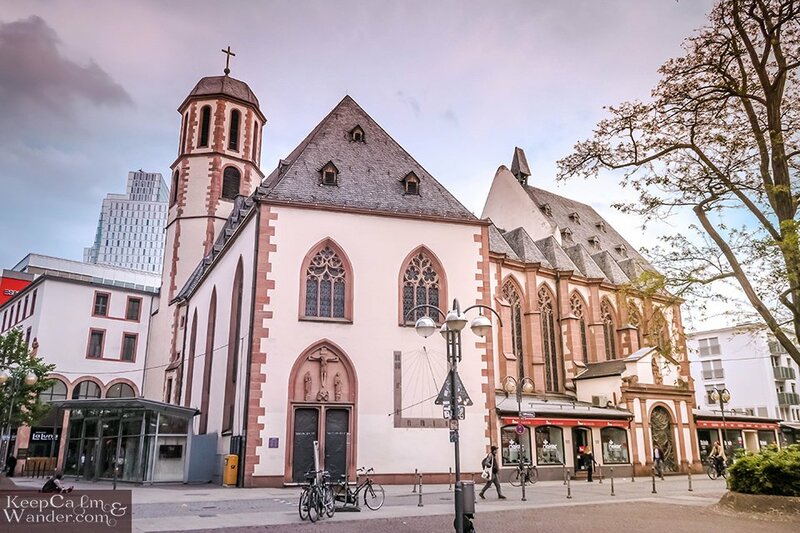 Johann Wolfgang Goethe, Germany’s literary national treasure was born in this city and his family used to attend at this protestant church. 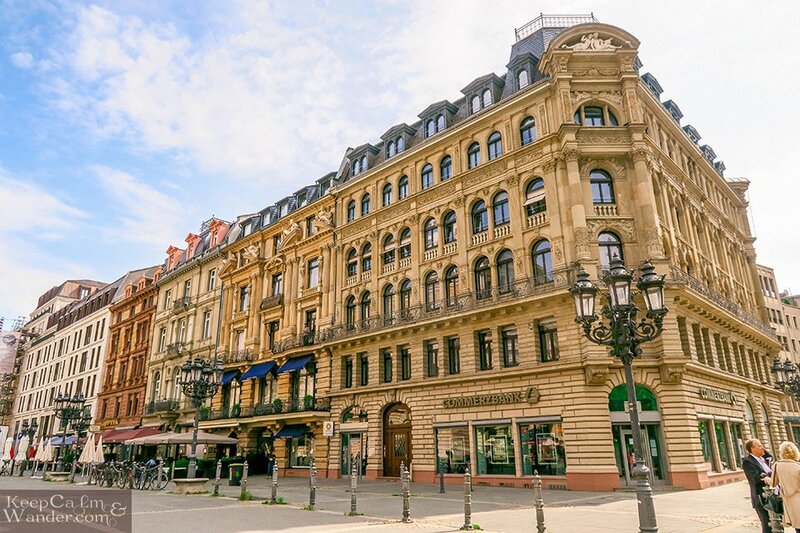 Travel Itinerary: One Day in Frankfurt (Germany). Out of 15 skyscrapers in Germany, 14 of them are in Frankfurt. The good news is that – the city never got rid of their old towers and buildings which can be seen around the city. Eschenheimer Turm was once a city gate. It was part of the late-medieval ramparts and one of the city’s landmark. Though the tower was built at the start of the 15th century, it blends well with the skyscrapers that surround it. In Germany, there are squares (Platz) everywhere. It’s a good idea to sit there for a while and observe how the locals go on their day. It was closed when I was there. There was a huge celebration going on at the square next to it. That was the time when Frankfurt won the German Cup last summer. Everyone was ecstatic and beer cans were everywhere! 😀 St. Paul Church started as a Lutheran Church which later became (and still is) a Protestant Church. Right in front of the entrance, you’ll find this amazing bridge. I have no doubt that Romerberg is Frankfurt’s most colourful square! 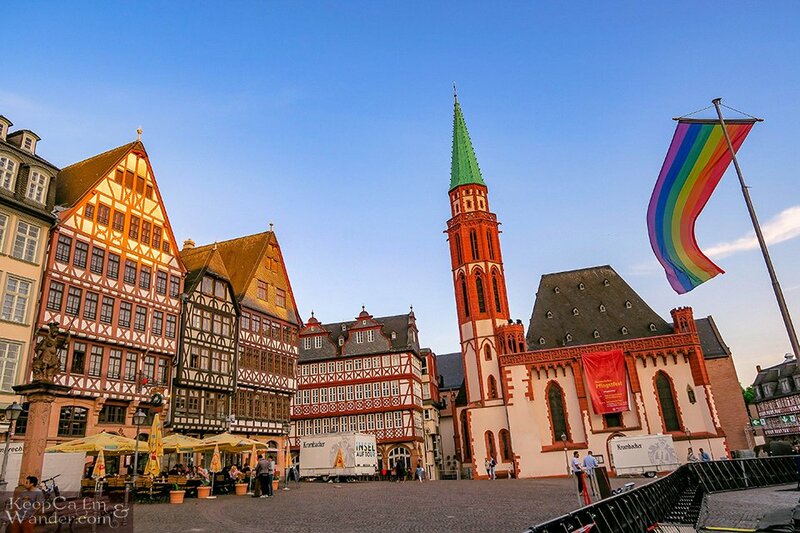 It is the city’s main square and Frankfurters gather here for small and big celebrations or parades. This is the place where you can fill your stomach with drink or food. But remember, it’s kinda pricey in this area. Römerberg is the Most Colourful Square in Frankfurt (Germany). Or attend a mass, if you’re into that sort of thing. It’s free to go inside the cathedral but off-limits to tourists when services are ongoing. It is a Roman Catholic cathedral with a Gothic design. It was an important cathedral where royal coronations were once held here. 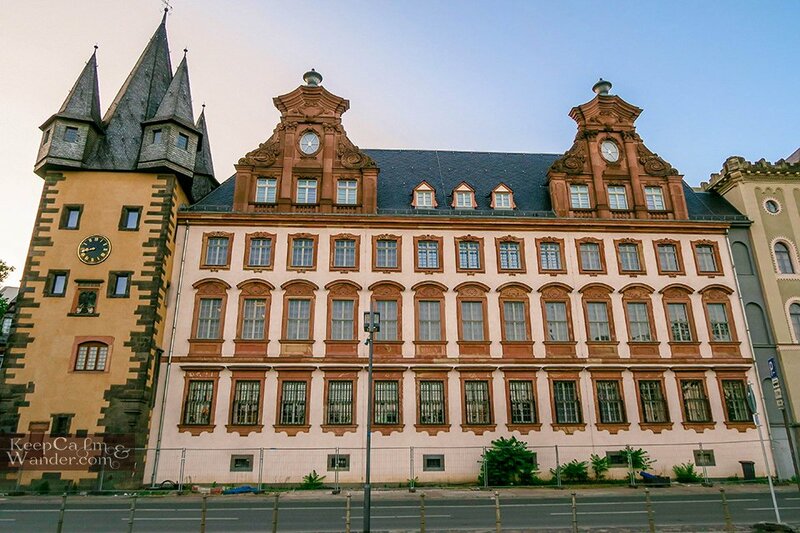 One Day Itinerary in Frankfurt (Germany). 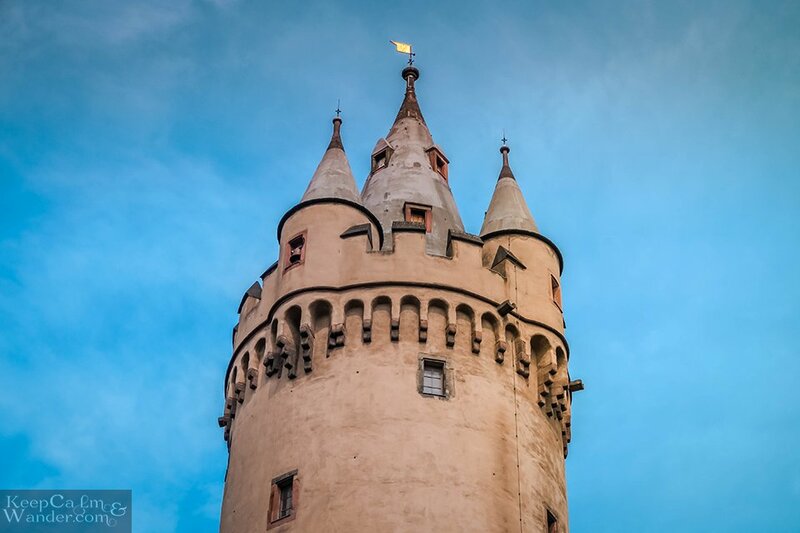 Do you think you can conquer 326 steep steps to the top of Kaiserdom? Then, it is a must to do this. If you have fear of heights and wobbly legs, you better not try this. 😉 I promise you – the views from up there are stunning! 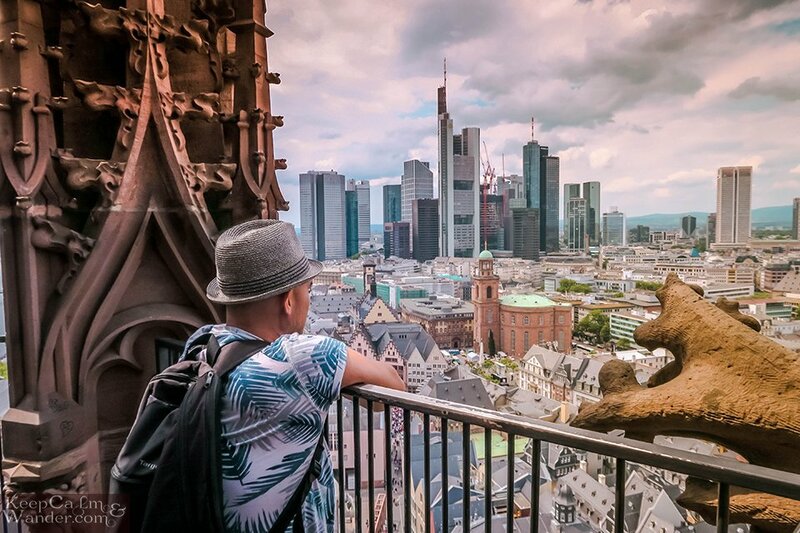 Compare the skyline views of Frankfurt from the Main Tower and the Kaiserdom. To end your day, stroll along the Main River. The sunset behind the skyscrapers is breathtaking. 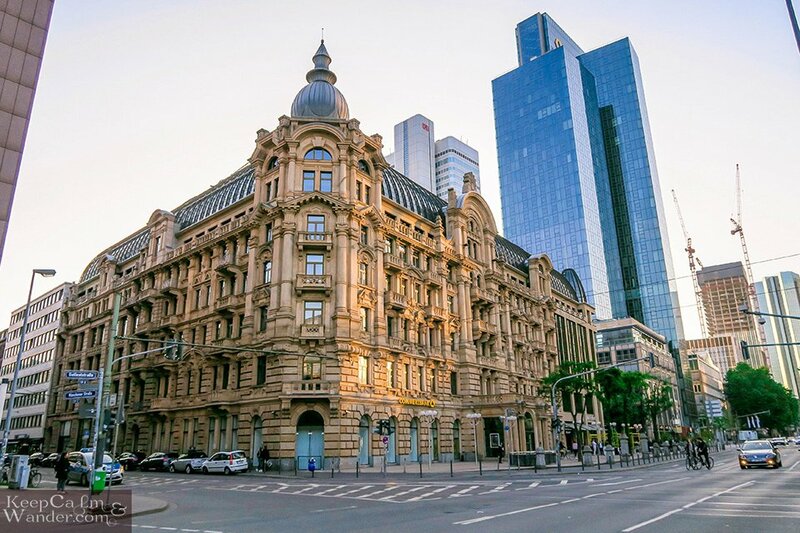 I stayed in Frankfurt for 3 days and two nights. Because I had an early train ride to Stuttgart, I checked in myself at Savoy Hotel which is just a few steps from the train terminal. The small room has got everything you need – that is – if your needs are simple, like mine. They have their own bar and the hotel is surrounded by restaurants, groceries, and bars. If you want to stay in hostels, you can find them here.